JP Fitzgerald and Rory McIlroy after the Co Down man's win in the Tour Championship at FedEx Cup last year. 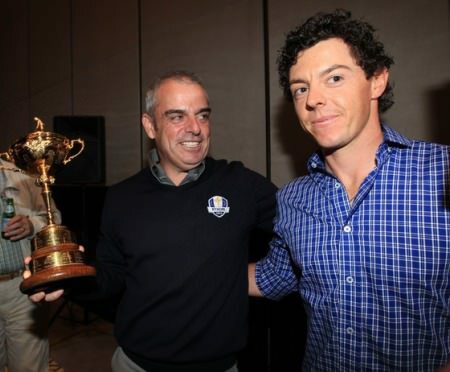 Paul McGinley is surprised at the timing of Rory McIlroy’s split with caddie JP Fitzgerald but believes the change could be the spark the Holywood star needs to get back to winning majors. According to reports, the four-time major winner has parted company with Fitzgerald after nine years together. Sources close to McIlroy have revealed that he has yet to hire a full-time replacement and will have one of his close friends — some of his childhood friends include Harry Diamond, Ricky McCormick and Mitchell Tweedie — on the bag for the next few weeks. But while McGinley is unsurprised that McIlroy and his former caddie Fitzgerald have decided to go their separate ways, he admitted at Lahinch yesterday that the timing — the week of the WGC Bridgestone Invitational and two weeks before the US PGA — is something of a shock. Speaking at the Lahinch during the Champions’ Day for former winners of the South of Ireland Championship that formed part of the club's 125th-anniversary celebrations, McGinley said: “The timing? It’s surprising. He’s obviously got his reasons and I don’t know what they are. “I don’t want to be critical of him and I haven’t spoken to him but going into the last major of the year, I’d agree that it’s surprising timing. “I'm surprised that he’s made that decision going to a golf course where he has won twice with JP on the bag. McGinley himself parted ways with Fitzgerald after seven years together and the former Ryder Cup captain has seen it all before. He said: “Rory is very much his own man. Rory makes his own decisions. Caddie-player relationships — what are they together now, nine years? — that’s way past what the average would be. “They have survived a long time in the pressure cooker of the top of the world rankings. “They have won four majors and I think both of them can walk away with their heads held high. It is one of those things that happens. “Is there a professional caddie relationship that has lasted a whole career? You don’t sack a caddie. You part ways. “JP was with me for six or seven years and we sat down and said, maybe this has run its course. Maybe it will freshen both of us up if we get different jobs. “So I said, JP you keep caddying for me and sound out if there are any other bags going and let me know. “Three weeks later he found Thomas Bjorn. I asked him how long he needed before he went and he said two weeks. “So I had two weeks to find someone and that’s when I got Darren Reynolds who was working for Roger Chapman. Fitzgerald has frequently been the subject of criticism for McIlroy’s course management errors such as the recent double bogey the Co Down man made at the 10th hole at Royal Birkdale in the third round of The Open. “I just completely took the wrong club on the 10th off the tee,” McIlroy said. "You either hit a club that stays short of all those bunkers or you take a club that at least only brings the traps up at 300 into play and I did neither." But McGinley is cautious about criticising any caddie for decisions that come down to both parties. “Tell me a caddie who doesn’t make mistakes?” he asked. “We don’t know what happened in that situation on 10 at Birkdale. “Maybe JP said to him, it’s a three-wood Rory and maybe Rory said it was a three-iron. “Unless you are privy to what is going on, it’s very easy to be judgmental from the outside and it’s very easy to be judgemental in hindsight. McIlroy prepares to solve Augusta puzzle: "There are so many variables rolling around in your head"